Life, knitting and sewing with a dash of vintage flair. I love it! So much easier for me to remember when visiting other sites. It's still with Typepad though, so I believe you'll just get routed there if you access it through the old address. That has been the question. Where I have I been instead of keeping up with my blog? Such an easy answer, but a huge mess of feelings behind it. Normally, it wouldn't even be worth mentioning, but since it's a reason that's still pretty much part of the equation, I felt it was worth mentioning. Back in the end of 2009 I was keeping busy, getting ready for the holidays as well as a Disney vacation when I came down with the flu just in time for Thanksgiving. As I recovered from that, I got hit by something even more debilitating. Depression. To be 100 % truthful, feeling blue isn't terribly abnormal for me, but really it was just that. Feeling blue. Some days would be worse than others, but they'd ease up in a day or two. This was different. I suddenly found myself barely able to function. Simply getting up everyday and out the door for work was a major achievement, many days it was the only thing keeping me going. My much looked forward to vacation was suddenly a huge weight. I didn't want to go. I didn't want to leave the house let alone get on a plane and travel all the way to Florida. I went, but was feeling miserable for the vast majority of the time I was there. I went with a friend and was trying my best to put on a happy face so that she wouldn't have any idea what was really going on inside my head. Coming home was a relief, and I dreaded the thought of going anywhere else. The holidays were approaching, and I was trying to handle them the best I could. I wanted nothing more than to ignore the entire holiday, and just stay home, but knew that it wasn't really an option. Luckily I had done all of my holiday shopping before this had started, but I still found myself putting up my Christmas tree hours before my company was to arrive on Christmas eve simply because I hadn't been able to get myself to do it any earlier. The following year wasn't much better. I started gaining weight at an alarming rate. I'd lost all joy for most of the things that I'd always loved. I stopped running, rarely went to Zumba class and seldomly picked up my knitting needles. Oversleeping was becoming a regular occurance. I could see all this happening, yet I was powerless to stop any of it. I felt like I was worthy of an Oscar award at keeping my disintegration from my family. While this was going on, I was supposed to be training for a half marathon. I'd force myself out on my long weekly runs. I had wanted to run the entire thing when I had signed up, now I was just hoping to walk it. One weekend on my long run I found myself simply unable to go on any further after barely making it through half my scheduled distance. I was sitting on a cement barrier trying to figure out how in the world I was going to make it home, as crawling 3 miles home wasn't really an option. Just the thought of the race had me in tears, dreading it, and the vacation scheduled around it. I just wanted to cancel the entire thing. A week or so before the race, I woke up feeling good. Good like I hadn't felt in nearly 10 months. I had energy, and wasn't feeling the weight of the world hanging around my shoulders. I don't know why, but I was greatful. I was able to go on my vacation, and take part in the race without having a nervous breakdown, and without the depression from the year before. Since then, things have been touch and go. Some days have been better than others. I wish most days were free of the sadness and heaviness, but with all truth most of them are rough. I'll have a few good days, and then I go through a time like earlier this year when I slept on my sofa for 2 weeks because I couldn't muster the energy to hang my laundry up or even clear it off my bed. The one thing that helps is my crafts. Knitting and now sewing have been a bit of a lifeline for me. They keep me focused when everything else seems to be falling apart. Now I just need to try to get my exercise back in gear again. I've been going to yoga class, but really that's been about it. I'm going to try to make it a goal to make it to the gym at least once this week, and grow from there. I always have the best of intentions, but by the time I get off the train at 7pm, I've had it lately. Doing anything is a chore. Hopefully if I start by just walking, maybe it will help. I'm determined not to let this get the best of me. I apologize for the lenth of this, and for posting the same entry to both of my blogs, but it was just easier as this really applied to both. Long time no post! I'm still here, still knitting . I just haven't seemed to make it here to my blog to post about it. I joined Ravelry and it pretty much everything I've been working on ended up over there. It's been so much easier to keep track of everything all in one place. Still I've missed blogging. As much as I love and adore Ravelry I miss the more personal aspects of blogging. I've recently started getting caught up with my favorite blogs again, and thought it was time to get my blog up and going as well. I will be making a few changes though. Since the begining of the year, I've learned to sew and have become completely obsessed with it. (It's been very difficult trying to balance to obsessions!) In particular, I've become fascinated with vintage designs from the 40's and 50's, as well as mid-century modern designs overall. Instead of just focusing on knitting, I'm going to be changing my blog a bit to be about my sewing projects, vintage goodies, and life in general as well. Just talking about knitting was becoming a bit more limiting to me, especially when Ravelry was taking over most of that. I'm excited about changing things up! Look, I really do knit! Poor Rapunzel had been sitting around nearly finished for ages in my knitting basket. I had a small little bit of sleeve to finish and that was about it. In early August the urge to finish her up took hold and I had the sleeves finished in no time. I not only wanted to finish her, but wanted to submit her to the Big E state fair. This was good in theory, but with a vacation scheduled for the last week of August was a bit of a reach. I did most of the piecing on the flight to Florida, and spent any of my free time at the end of the night working on the collar. I finished her the day before I had to have my package postmarked by for the fair entry. Actually I still haven't added on the crochet trim, but my mother has a hold of the sweater now and doesn't show signs of wanting to give it back. It looks like it pulls a bit in that photo, but once I add the trim and the buttons it will be fine. It was supposed to be for me, but my failure to test swatch, and my super tight knitting made sure there was no way the sweater was going to fit me. 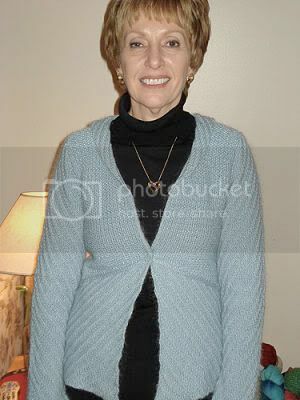 I knit the sweater in the large size, and it just fights my mom who usually wears a size small. I was unsure in the begining how I was going to like the Lurex Shimmer color that I ended up using. 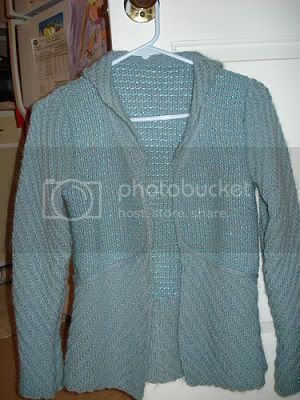 The original sweater used a pewter color with the glacier blue Kid Classic. Lurex Shimmer had already been discontinued when I started making this sweater and was unable to find any of the pewter colorway. I found two balls in "Minty" at my LYS that I ended up using. It's a pretty green/blue color and it works great with the the glacier. I'm so glad I didn't end up using the pewter. The shimmer had a great and unexpected pop to the sweater. Knit with Rowan Kid Classic (Wool, Mohair, Nylon Blend). 10 balls of Glacier, and 2 balls Rowan Lurex Shimmer in Minty. I loved this project, crazy ends and all. The pattern held my attention throughout and never got boring at all. 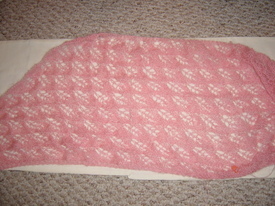 The knit-on icord was a bit tedious, but wasn't as bad as I was expecting. I knit it pretty much without any changes. I think I made the collar a bit shorter, but that was about it. I really need to swatch before I make my next Rowan pattern. I'm a tight knitter and always seem to end up with things that don't fit in the end. 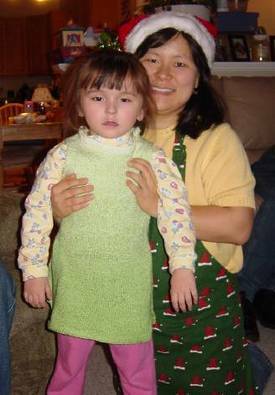 When I was working on the sweater down in Florida, my family was all trying to talk my mother into letting them have it. She was thrilled that I screwed up and she ended up with it. I loved using the Kid Classic. So soft and touchable. It is works perfectly for this sweater. The lurex shimmer isn't my usual style, but it works with this pattern. Since it's only used fair-isle style just little bits of it show up and it adds a nice touch to the sweater. I'm glad I used it. And how'd Rapunzel do under the judges harsh glare? Woo-Hoo! Second place. I was thrilled, as this was my first ever entry. I lost out to a gorgeous aran sweater so I can live with that. 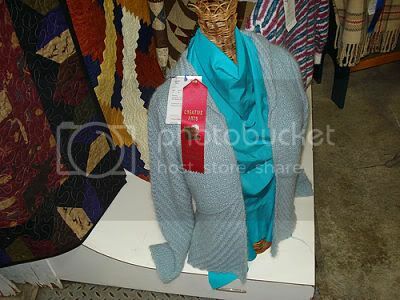 My judging card said it liked the yarn choices and the pattern. My edges looked a bit rough (still needs that crochet trim) and some of my stitches were a bit uneven. I always end up a bit uneven when I work on something in a pattern that alternates between knit and purl stitches. It's something I need to work on to improve my knitting. (Either that or just knit things in the round). Wow. It's been a long time hasn't it? I hadn't even realized that it has been nearly 2 years since I've posted here. I went through a period when I did barely any knitting. Working in NYC has really changed my knitting habits, and I've been finding myself getting home after 7pm and being too tired to even think of picking up the needles. I used to do more knitting on the train, but most of the time I've been finding myself taking catnaps on the train. I don't think that I realized how draining the commute was going to be. I also became a bit obsessed with a thing called the Dis boards and planning the two Disney vacations I've taken since my last posting. Socializing there took what was left of my very little free time. I have been working on a few knitting projects, more slowly than I used to, but I've still had things on the needles. 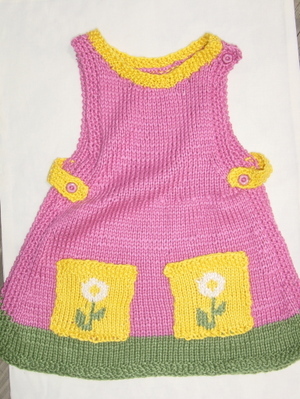 Back in August I decieded that I wanted to finish my Rapunzel sweater so I could submit it to the Big E state fair. It had been sitting barely touched since I had started working in New York. Very sad, especially since all it needed was for the sleeves to be finished. I finished the sleeves right before my late August vacation, and spent most of my flight down to Florida piecing it together. I got the collar added on over the course of vacation and came home with a finished sweater just in time to make the submission date for the fair. How'd it do? I'll save that news for when I post the pictures of the sweater. Since then I've been reinvigorated with my knitting. I started a Rhinebeck sweater. I didn't quite finish it, but have a bit more of the sleeves to do. (Those sleeves kill me every time!). I picked up some yarn at Rhinebeck and have a few new projects on the needles. It feels good to be knitting again. I don't think I realized how much I had been missing it. I also finally signed up for Ravelry, and that has been feeding my renewed obsession as well. (my name is "ibelle" on Ravelry) I found a knitting group in my home town to, and it's been really nice to get together with other knitters. I've been missing blogging to, and am going to try my best to balance all my addictions. Everything in moderation, right? Now I just need to learn to read my Disboards while knitting! Doesn't seem too enthused does she? Actually she had really liked it until she was asked to put it on for a picture. Then I got that face. I like to think of it as being part of her charm. Needless to say I never got a really good picture of it on her to my dismay. I don't even know if she ever even wore it after that. These days she's a bit fascinated with my knitting, and she loves telling people that I made her things. She put in a request for mittens for next winter so I'll have to do my best to oblige. Luckily I have two nieces. 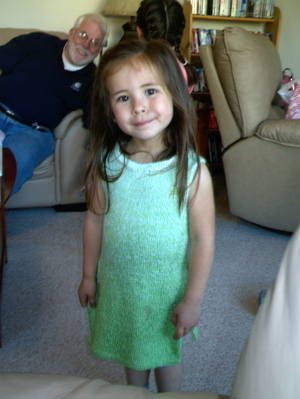 I had forgotten all about the Onde tunic until I was at my brother's house for DN1's birthday party a few weeks ago. I had eventually faced the truth that I'm an indulgent aunt and bought Megan the outfit for her that matched the outfit I bought for her American Girl doll for Easter. She was thrilled. She told me it was her #2 favorite present. (I got edged out by her American Girl doll's dog Jip that my parents gave her.) It made me better about shelling out so much money for kids clothing. Anyways she had to try it on right away, and have her hair fixed to match her doll. While this was going on DN2 was feeling a little bit left out. She loves playing dress up and was missing out on not having any new clothing to put on. She ran off to her room and came back with this on. At least someone appreciates my Onde tunic! My sil told me it's her new favorite thing to wear. They can't get her out of it to wash it. The problem was that she doesn't want to wear it with pants. She insists on wearing it as a dress, but when she does the slits on the sides are so far up she's running around with her underwear hanging out. She a little pip squeek so it actually is the perfect length for a dress on her. I still had some of the yarn at home, so I brought some with me the next time I visited and voila it's now an Onde dress. I just love when my projects end up with people who love them! It's Anouk 3. Can you tell I really love this pattern? This is the third Anouk I've made, and I haven't tired of the pattern yet. It's so quick and easy, and most importantly absolutely adorable. While I'm happy with this incarnation of Anouk, it's probably my least favorite color combination of the three I've made. The orange/yellow combination is still my favorite, followed by the teal/purple combination. I was kind of stuck on this one, because my LYS had a very limited color selection for the main color. I was able to use up left overs from my stash for all but the main color. Irregardless the recipent should love it (or her mother at any rate). The color choices are perfect for her tastes, and that's what really matters for a gift. On a side note my intarsia abilities really aren't improving from project to project. I find it very hard to keep the proper tenstion between the color changes. I end up either too loose, and have big gappy stitches, or I knit too tight and it doesn't lie right. Usually I do both within the same project. I am determined to improve. Here's the round-up for Anouk 3. Knit with Cascade Pima Tencel (50% Pima Cotton, 50% Tencel). Worked with 2 balls pink (#1317) and color remnants of no more than a 1/2 ball each of leaf green (#4084), sunflower yellow (#0258), and natural (#0030). Pattern Notes - I love Anouk and can't recommend it enough for someone looking for an quick and easy project to give as a gift or for their own little girl. It's a great project for someone wanting to move up from the basics too. The shaping is simple, and the piece doesn't require much finishing. Yarn Notes - My newest version was made in the 6 months size and the Pima Tencel works very well for that size. My prior orange version was made in the smallest size, and the teal was made in the largest size. Having made this in three of the sizes I've found that the Pima Tencel works best in the smaller sizes. The Pima Tencel has a lot of weight and drape to it, and it was a bit heavy for the largest size. The skirt on that one pulled a bit too much while my niece was trying to walk around in it. A lighter weight yarn would probably work better for the larger sizes. Pattern Changes - I made only two small changes to the pattern. On the left shoulder side (the side with the button) I increased the rear shoulder by a few rows. I find it easier to attach the button if there is a little bit more of an overlap to the front and back pieces. The only other change I made was to knit the collar in the same color as the pockets instead of using the main color. It's just a personal preference, but I just like adding in a bit more color into the pattern. Will definitely not hesitate to use this pattern yet again! The weather here in Connecticut finally decided to start feeling like Spring, just in time for the wedding I went to on Saturday. After the incredibly cold and wet weather we had for the past few weeks this was a welcome change. You couldn't ask for a nicer day, my friends really lucked out for their wedding. I was grateful as I was convinced all last week that I was going to freeze wearing my new dress, and that maybe I had better come up with some kind of a contingency plan for a backup dress. Luckily no back up was necessary, and all I needed was my new Birch, which was just the light cover I needed for my shoulders with the a/c at the reception. I apologize for the quality of the pictures. I was expecting two of my friends to be at the wedding and have one of them take a few pictures for me but one got stuck working, and the other never bothered to tell me she wasn't going. I ended up at at a table with a bunch of people I didn't know. (Note to self - you must find someone to drag along as a date to these things.) The couple sitting next to me was quite nice, but overall it's still rough being at that table with the miscellaneous group of people. A few of my good male friends were at a different table, but I didn't want to try to explain why I needed them to take pictures of me with my shawl. I used the timer on the camera when I got home. They aren't the best but they'll do. The back view of Birch. I was happy that the seam I was so concerned about really just blended in against my dress. If I turned it around so that the wrong side was facing out it barely showed at all. Knit with 2.5 skeins (250 yards each) of Louet Kidlin Pixie (49% Linen, 35% Mohair, 16% Nylon) in Rose Bloom (04) on Clover Bamboo Straights. Pattern Notes - I'm really happy with how my Birch came out. I'm very glad that I chose to make this Birch using Julia's modifications. Her notes on how to adapt the pattern are easy to follow. I followed her modifications with just two changes. The first was that although I didn't work the regular decreases at the end of each right side row, I still needed to work the decrease on row 8 (the only decrease on the purl row) in order to keep the shape of the pattern correct. 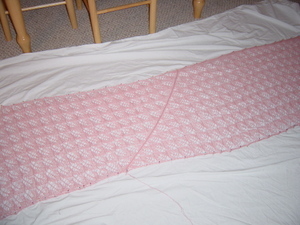 I'd work the decrease on the last two purl stitches, and then knit the last three that I was using as a border. On the next row (row 1 of the pattern) I work across until I had the three border stitches left on the needle and then increase one stitch before knitting the last three stitches. Without working this decrease and increase the leaves formed in the pattern would pull wonky to one side and didn't look right. The only other change I made was to work my two pieces about 10 inches longer on each side. Mine measured about 30" or so before blocking. This was by accident, I was on a roll knitting and forgot to keep measuring, but in the end I was happy it ended up being longer. I love a shawl you can really wrap yourself up in. Yarn Notes - This was my first time using Kidlin Pixie and I found it to be an acceptable substitute for Kidsilk Haze. It's not as soft as Kidsilk, but still feels decadent, and the linen in it gives the same hazy appearance that Kidsilk does. It was a bit cheaper than Kidsilk Haze, but not significantly so. (Especially as you only need 3 balls of it.) The color range worked better for me for this project. It's a very strong yarn too without looking like it. Don't try to break this without scissors! I like that even though the shawl looks fragile and delicate it's not. Check out Julia's notes on Birch for more help. She's got great hints there, and it would be silly for me to just reiterate them. I actually finished something this year!!! I finished Birch on Friday night, but had to hold off on blocking it until yesterday because I had company over the weekend. Here's a picture of it pinned out on my floor. I'll get a better completed picture of it this weekend at the wedding. I'll give some more detailed notes when I post a better picture, but overall I love the modifications of my long Birch shawl. I did screw up and bind the two pieces off on the wrong side so the seam is really apparent, but I can live with it. I tried to tink back and fix it, but I was causing more damage than what I was fixing so I left it. I promise more details later! I'm so excited I finished this week with plenty of time to spare. Heck I didn't even have to rush. I don't know where the time this year has been flying to, but it has definitely been getting away from me. My new job has been keeping me exhausted. I'm not the world's best morning person so getting up and having myself on the 6.30am train is really difficult. Last week I was so beat that I overslept 3 days. Luckily I was able to catch the next train at 6.50 which still gets me to work at time, but my goal this week is to break that habit. I don't want to get used to taking the later train. I like having it there for emergency purposes. The exception rather than the rule. So far so good. Woke up right on time today. I just need to be sure I get to bed at a reasonable hour tonight. Lace. Birch from Rowan #34 to be exact. 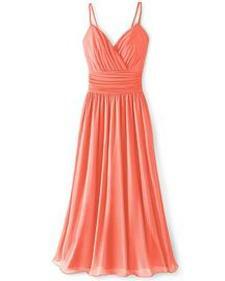 I have a wedding to go to at the end of the month and had bought this dress from Newport News to wear to it. Aren't you all surprised I bought a dress for an event and didn't drive all of you nuts asking for opinions on dresses? It was one really nice bonus of losing weight that it was much easier to find a dress. I got the catalog in the mail, saw this, and had to have it. No hunting around trying to find something from one of the few plus-sized retailers. Open a catalog and order something. Love it! The only problem is that this shows a lot more skin than I am used to exposing. I was a little unsure about the spagetti straps, and the low cut of the front but it looks beautiful on and feels secure. I just need to get over a few minor insecurites about my body. It cried out for a nice wrap though. April is an iffy month around here in Connecticut. I could be a beautiful spring day or freezing. I bought the wrap that Newport News sold that matched the dress, but it's the same sheer lightweight material as the dress. No warmth at all to it. It is also very tiny. I wanted something I could wrap around myself. I contemplated borrowing the Birch Shawl that I had made for my mother two years ago, but it was light green and really didn't go. (Okay to be honest the light green looked fine with the dress, but I really wanted to buy new yarn). I had plans to meet up with an old college friend two weeks ago after work, so after she had to postpone our meeting at the last minute, I took advantage of the chance to take the subway down to lower Manhattan to do some yarn shopping. I was a bit nervous about this, as my sole foreay on the subway in NY has been to Union Square Park and back for the NY Yarn-Out, and from Harlem to Yankee Stadium. I wasn't even sure exactly how to get to the shops I wanted to hit (The Point and Purl) as I had only been to them once before with Susie, and we had walked there. Luckily I found this site that has a wonderful interactive subway map that tells you which subway to take to get between any two points in New York. It got me exactly where I needed to go, so I recommend it. The only problem is that it doesn't give you any walking directions to get from the subway station to your location. Once I got my bearings though on which was was North and South I was fine and got to both locations with relatively no problems. I went to The Point first and looked around a bit before heading over to Purl. I had originally planned on using Kidsilk Haze as I just adore the stuff, but none of the colors looked quite right with the color of the dress. Even the whites and off-whites didn't quite look right with the dress. I had the same issues with the Kid Seta yarn I tried too. Nothing was quite right. I had been hoping that someone would have carried Douceur et Soie. I had gone online and seen that they carry a great coral color that might have matched the dress exactly, but alas no one had it. Nothing was quite right, and I was just about to give up, go home and order some Douceur et Soie online (or at least wate until I could try Knitting Central in Westport). Then I saw this, and while I hadn't planned on using pink with a coral dress I actually liked the way this looks with it. It's Louet's Kidlin Pixie in Rose Bloom. 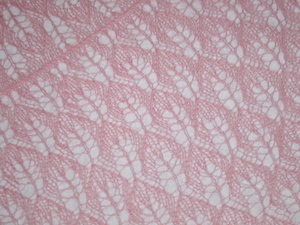 While the KidSilk Haze pinks looked all wrong with the coral, the undertones of the Kidlin complement it nicely. Kidlin is a mohair/linen/nylon blend that is amazingly strong. (Found this out the hard way when I went to break a strand of yarn). While it's not quite as decedently soft and luxurious as KidSilk Haze, it is still fairly soft and gives off a similar hazy appearance. I'm anxious to see how it blocks out in the end. I also chose to try Julia's modifications to Birch to make an oblong/rectanglish wrap instead of a triangle. Both my Charlotte's are triangles, as was the Birch I made for my mother, but for this I really wanted something long. I finished the first piece in less than a week, and am now working on the second piece. It shouldn't be long before I'm back to finishing up those Rapunzel sleeves. I don’t foresee any problems finishing on time for once. I love the Birch pattern. It's so easy to memorize and is simple enough that I can work on it while on the train. Since this is a rectangle shape, I never had to worry about those huge long 200 stitch rows either. The rows are the perfect length. I can finish one up fairly quickly so that I can end a row if my stop is coming up. My goal is to finish the second piece this weekend. I'll post finished pictures as soon as I do.